Posted On December 16, 2016 by &filed under Legal Articles. The question of materiality, it is universally agreed, is an objective one, involving the significance of an omitted or misrepresented fact to a reasonable investor. 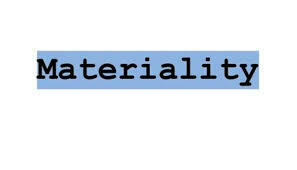 The General standard of materiality could be summed up as, omitted fact is material, if there is a substantial likelihood that a reasonable shareholder would consider it important in deciding his investment decision or vote. Here we analyze a reported judgement of Zee Telefilms Limited (”Appellant”) in 2003, In the said case the Appellant was issued a notice by SEBI stating that it had failed to comply with the requirements of Regulations 6(2), 6(4) and 8(3) of erstwhile Takeover Regulation 1997 and in that context penalty of five lakh rupees was imposed on the Appellant. The Appellant had contended that it had not intentionally suppressed any material information, which was to be disclosed under the regulations and that, the Appellant on its own had disclosed the belated reporting in the letter of offer which was issued by it in the context of the public offer made by it relating to the acquisition of shares in another Company. The Appellant stated that , material information was submitted is the fact that the Appellant itself had disclosed voluntarily the default, goes to prove the bonafides of the Appellant, that if it had not so disclosed, perhaps SEBI would have never noticed the failure and proceeded against for such default. The Appellant further stated that they had not acted willfully and thus penalty shall not be imposed. The Respondent refuted all the claims of the Appellant and stated that, no where did the Appellant disputed that reporting has not been belated and delay was substantial. Comment: – The appellant had made willful disclosure but if they have not done that the offer letter would not have been considered proper. Such a disclosure was made due to compelling requirement and thus they cannot claim that disclosure made by them willful and voluntary. Penalty is not leviable for an omission or commission not done willfully which was upheld in judgement1. Section 15-J provides various factors which are to be taken into consideration while adjudging the question of penalty under Section 15-l namely, the amount of disproportionate gain or unfair advantage whenever quantifiable, loss caused to an investor or group of investors and the repetitive nature of default. Considering said case the Appellant alleged that legislature in its wisdom had not included mens rea or deliberate or willful nature of default as a factor to be considered by the Adjudicating Officer in determining the quantum of liability to be imposed on the defaulter. The Appellant in the said case contended that there was no mens rea on his part and nor its promoters secured any disproportionate gain or unfair advantage that the belated reporting has not resulted in wrongful loss to any investor, and the delay in reporting was an isolated one and was not of repetitive nature. The Respondent supplemented its contention through a judgment2 and stated that it is not necessary to establish mens rea for the purpose of imposing penalty is not comparable in the present case. Comment: – The notion that a penalty or a punishment cannot be cast in the form of an absolute or no-fault liability but must be preceded by mens rea should be rejected. The classical view that ‘no mens rea, no crime’ has long ago been eroded and several laws in India and abroad, especially regarding economic crimes and departmental penalties, have created severe punishments even where the offences have been defined to exclude mens rea3. In the present case, Executive Director of Ispat Industries Limited4 in an interview given to CNBC in 2003 and which was reported on www.moneycontrol.com on the same day that, the Company has is targeting a turnover of Rs. 4000 crore , capacity expansion programme of the Company along with cost saving initiatives would result in savings of about Rs.1000 Crores a year , the contribution of long term contracts to sales would move up to 50% from the current 10% , The export target for the current fiscal had been pegged at Rs.1300 Crores. SEBI issued a notice that aforesaid averments were not been disclosed to the Stock Exchange as required to be disclosed as required under SEBI Insider Trading Regulation 1992. The Company had replied to notice of SEBI stating that proposed additions to their steel making capacities has been duly notified to the stock exchanges as part of details relating to quarterly financial results of the company and planned capacity expansion has been duly set out in the annual report of the Company and in this regard they have invited reference to the statement contained in the Director’s report on accounts of the company for the year ended 31.3.2003. The cost benefits have been disclosed in Annual Report and targeted exports for the current financial year were in line with capacity enhancement effected during the current financial year. The Company reiterated that interview was general in nature and not made with a view to influence the market sentiments. · Whether the information relating to projections of turnover, cost savings, export target and capacity expansion constituted price sensitive information? · Whether the Company had failed to disclose the information as required by Insider Trading Regulations? was introduced as a preventive measure to curb insider trading. Here there are two aspects, the first being, can general discussions about the company’s visionary plans and the projects being undertaken by the company and such normal conversation about visionary plans should be viewed as Price Sensitive Information and secondly misleading and and premature announcements relating to the company could be done to generate investor interest in the scrip and to shore up its stock price. Supra of judgment of SAT5, “whether a transaction has been executed with the intention to manipulate the market or defeat its mechanism will depend upon the intention of the parties which could be inferred from the attending circumstances because direct evidence in such cases may not be available”. In this case, SEBI made an observation that financial statement did not contain the disclosure as stated by the Executive Director, the information is a price sensitive information and thus Company had not complied with the requirement of Disclosure as required by Regulations. c. DLF Limited vs Securities & Exchange Board of India & Ors. In this case, DLF had filed Draft Red Herring Prospectus (DRHP) with the SEBI on May 11, 2006 it was indicated that Sudipti Estates Private Limited (“SEPL”) was one of the joint ventures of DLF. The said DRHP was withdrawn and a fresh DRHP was submitted, in which SEPL was not mentioned as being associated with DLF. A complainant filed with SEBI alleging that SEPL had defrauded him for sum of Rs. 34 crore (approx.) and in order to safeguard the interests of general public, the listing of DLF pursuant to the IPO be disallowed and immediate action be taken in this regard. Aggrieved by inaction of SEBI the Complainant file a writ petition which was been allowed by learned Judge and ordered for investigation. DLF Ltd. had 3 wholly owned subsidiaries namely DLF Home Developers Ltd. (“DHDL”), DLF Estate Developers Ltd. (“DEDL”) and DLF Retail Developers Ltd. (“DRDL”) which held equity shares in SEPL, Shalika Estate Developers Private Limited (“SDPL”) and Felicite Builders & Construction Pvt. Ltd. (“FBCP”). On November 29, 2006, the entire shareholding in Felicite held by DHDL, DEDL and DRDL was sold to three persons namely, Mrs. Madhulika Basak, Mrs. Niti Saxena and Mrs. Padmaja Sanka. These three persons were wives of Mr. Surojit Basak, Mr. Joy Saxena and Mr. Ramesh Sanka, respectively who were the KMPs of DLF. On November 30, 2006, DHDL, DEDL and DRDL sold their entire shareholding in Shalika to Felicite. On the same date, DHDL and DEDL, sold their entire shareholding in Sudipti to Shalika. The three shareholders who, pursuant to purchase of shares of Felicite from DHDL, DEDL and DRDL on November 29, 2006, became 100% shareholders of Felicite, which in turn became 100% shareholder in Shalika and which in turn became 100% shareholder in Sudipti, were spouses of KMPs of DLF. All the three transferees were “Housewives” and they held bank accounts jointly with their respective husbands. On this basis, it was alleged that their purchases of shares in Felicite were funded by their respective husbands’ joint accounts of their respective husbands it was alleged that DLF did not lose control over these three entities. · Non- Disclosure of financial details relating to subsidiaries. · Sudipti, Shalika and Felicite continued to be subsidiaries of DLF consequent to the sale of shareholding by the wholly owned subsidiaries of DLF in them and on the relevant dates there was “holding -subsidiary ” relationship between DLF and those three companies. Therefore disclosure in RHP/Prospectus as per regulatory requirement was mandatory. · Since FIR cannot be construed as an outstanding litigation, however a FIR in question do contain material information so as to enable the investors to take an informed investment decision and since the FIR was been lodged against one of Companies subsidiaries it should have been disclosed. Here we discuss, a case6 decided by US Supreme Court where the Respondent alleged that the petitioners (“Matrixx”) violated provisions of the Securities Exchange Act of 1934 and Securities and Exchange Commission by failing to disclose material adverse effect reports of a possible link between Matrixx’s leading product, Zicam Cold Remedy, and loss of smell (anosmia), rendering statements made by Matrixx misleading. Petitioner had disclosed product liability litigation generally but did not disclose the lawsuit filed against them for Anosmia which was caused by their product Zicam. · As all adverse effects shall not necessarily required to be disclosed and reported, the determination of materiality shall be on a case to case basis. In the instance case, Zicam the product of Matrixx was an important product and non-reporting of adverse report would substantially affect investor’s views. Thus adverse information report would be material information for disclosure. · Considering the said case, if any lawsuit is pending against product liability claim than the Company shall specifically disclose the same as general disclosure would not be suffice. The test of materiality is to be determined taking into account facts and the possible impact that the information/event under consideration may have on the investor’s investment decisions. 100 queries in 0.193 seconds.